Blindfold your eyes, let your heart walk you home. Going through the movements and motions of yoga may not be enough to bring this profound transformation if during yoga class your mind wanders from mat to mat, looking at the people around you, looking at their clothes, looking at how they hold poses, or any other type of thought or judgement that may pass through your mind during yoga class that is not about inner reflection. 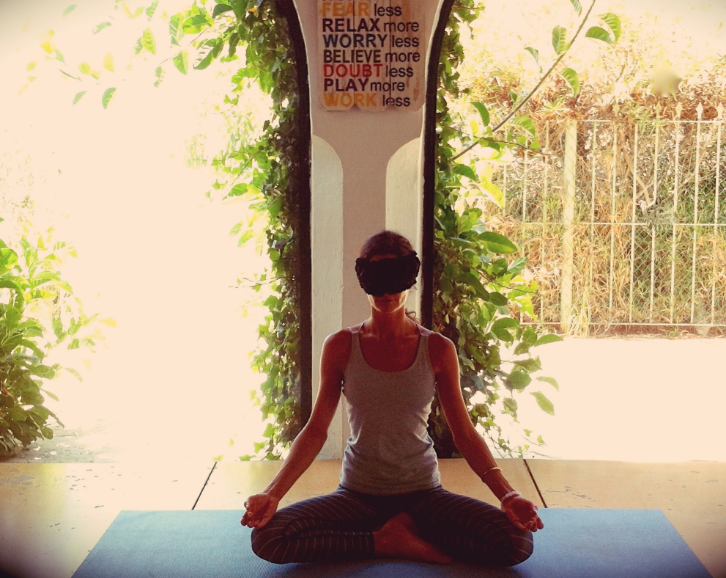 Blindfolded yoga can remove the external and visual stimuli that can exist in yoga classes, and help turn your attention inward. With nothing to look at, other than your internal world, you are forced to observe your mind, its patterns, and its reactions. As such, blindfolded yoga can help the mind slow down and calm down. We have experienced the stability that comes from conscious connection to the ground. I felt love from people I did not know and I could not give a face or a name. The main way to try to control the environment and what happens in life is normally the view. When we stop seeing, something that seemed as complex as loose or take occurs spontaneously and access the infinite world that gives the uncertainty, the eternal quality of reality, the true present. This morning I have lived an ocean of feelings that remain and come with me beyond the Yoga mat. On days when focus escapes me, and I find my mind wandering away I close my eyes and reconnect with my inner self. Thanks Inga for each and every one of your teachings. Next blindfolded practice will be in August.